Prachi and Shahana win over the college by putting down Rhea. How will Rhea react to this loss? In the previous episode of Kumkum Bhagya, Abhi and Pragya are left wondering why the voice on the distorted phone call was so familiar to each other. Pragya is also afraid of Prachi looking for her father in Delhi. Prachi and Shahana are looking forward to their first day of college, but they end up getting ragged by Rhea and her friends. However they manage to turn the tables on her. In tonight’s episode, Prachi slaps the nerd and puts Rhea in a tough spot. Now Rhea has the kiss the boy she hates to complete the dare. She backs down from the dare but people begin putting pressure on her to complete the dare, including her friends. She tries but ends up pushing the nerd away. 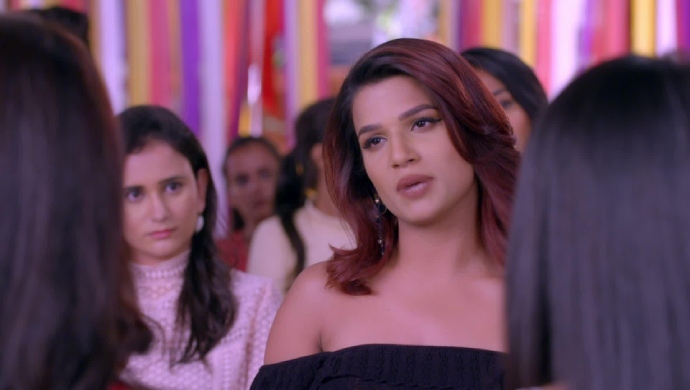 Shahana and Prachi taunt Rhea for not being able to complete her side of the dare and tell her to not rag people if she can’t take the same punishment. After seeing Prachi impress her friends, Rhea swears to make life difficult for Prachi and Shahana. Shahana wants to go and check-out the guys in the college while Prachi wants to go for college lectures. Eventually Shahana decides to go watch the football game where the college stud Ranbir is playing. Prachi goes for her regular lectures. Ranbir ends up scoring the winning goal for his team. Shahana is floored by him and wants to tell Prachi about Ranbir. Meanwhile Prachi finds a football and goes to the locker room to keep the ball back where she already runs into Ranbir. Rhea goes to her aunt Aaliyah Mehra to complain about Prachi who tells her to get her revenge from Prachi. She also tells her to forget about what happened in college and focus on her birthday. Prachi’s aunty on the other hand asks them for rent money to stay at their house. Prachi decides to get a job to pay for their staying at food. Will Rhea get her revenge on Prachi? Will Prachi get a job to avoid taunts from her aunt? Stay tuned for further updates.